... as well as minor accessory glands found throughout the mucosa. Are these exocrine glands or endocrine glands? A diagram of part of a salivary gland showing a serous acinus and mixed serous-mucous acinus. 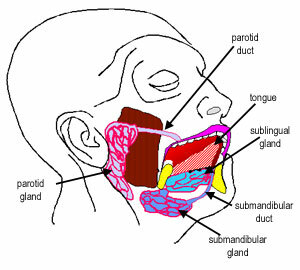 Salivary glands are made up of secretory acini (acini - means a rounded secretory unit) and ducts. There are two types of secretions - serous and mucous. The acini can either be serous, mucous, or a mixture of serous and mucous. 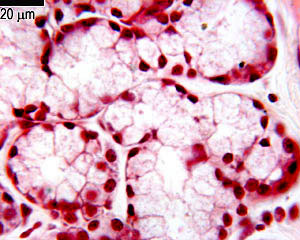 A serous acinus secretes proteins in an isotonic watery fluid. 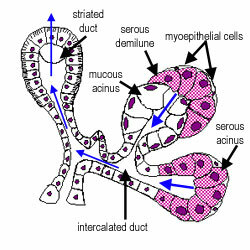 In a mixed serous-mucous acinus, the serous acinus forms a serous demilune around mucous acinus, as shown in the diagram. The secretory units merge into intercalated ducts, which are lined by simple low cuboidal epithelium, and surrounded by myoepithelial cells. These ducts continue on as striated ducts. These have a folded basal membrane, to enable active transport of substances out of the duct. Water resorption, and ion secretion takes place in the striated ducts, to make saliva hypotonic (reduced Na,Cl ions and increased carbonate, and potassium ions). The striated ducts lead into interlobular (excretory) ducts, lined with a tall columnar epithelium. The glands are divided into lobules by connective tissue septa. Each lobule contains numerous secretory units, or acini. Images A,B, and C are of three different salivary glands. In image A you can see both secretory acini, and a duct. Can you identify these two features? Now see if you can determine which type of glands A,B and C are. A: - Parotid gland - serous glands. B: Sublingual gland - majority of the glands are mucous secreting. C: Submandibular gland - mixed serous and mucous glands. Sublingual glands have mainly mucous acini. Parotid glands have mainly serous acini. Submandibular glands have a mixture of mucous and serous acini. 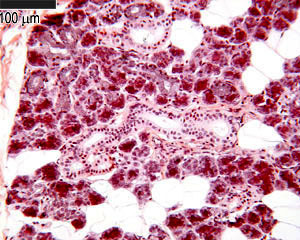 Mucous acini stain more weakly than serous acini, because of the techniques used to produce the sections. (look back at histological techniques to remind yourself).